Know the right aspects to consider when ordering your access control wristbands. There a variety of different wristbands you can use for access control at your event. It may be quite difficult for you therefore to choose which one is best. We’ve put together a useful buying guide you can use to make the right wristband decision for your event. Wristbands vary in their security features which therefore influences price. If you’re hosting a very exclusive event, using fabric wristbands is a good idea. Read more about wristband security features in our comprehensive article. 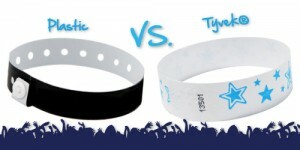 Although all wristbands provide excellent tamper proof and duplication proof security features including Tyvek and vinyl wristbands, the level of peace of mind does differ according to which one you choose. Certain wristbands such as Tyvek wristbands and vinyl wristbands can be produced very quickly depending on the complexity of branding needed. Single colour Tyvek wristbands can be produced within 24 hours and vinyl wristbands can take 2 to 5 days. Full colour Tyvek wristbands may take up to 3 weeks and Fabric wristbands take 2 to 3 weeks to produce. Therefore if you need wristbands within 24 hours it’s best to choose single colour print Tyvek wristbands. Wristbands range in price from Tyvek being the most affordable to the most exclusive ranges being Silicone and Fabric wristbands. Pricing however shouldn’t be your only consideration and it’s important to look at all the elements mentioned above before choosing which wristband type to order. It’s important to understand what the access control needs are for your event in order to help you to make the most effective yet economical decision. For all your Access Control Wristband needs contact IDCBand today. IDCBand is the leading supplier of wristbands, lanyards and promotional items in South Africa. For a huge variety of styles, colours, designs and functionality of wristbands, contact IDCBand on +2711 675 5548 for a free quotation. © 2019 Wristbands. All Rights Reserved.